The original SailTrack is software designed to record, store, and play back sailing races. It is ideal for teaching tactics and getting feedback on errors. Fit a small, and waterproof GPS receiver to each boat, then after the race, upload the track data into SailTrack. You can then play back the whole race, pausing, re-winding, and fast-forwarding. 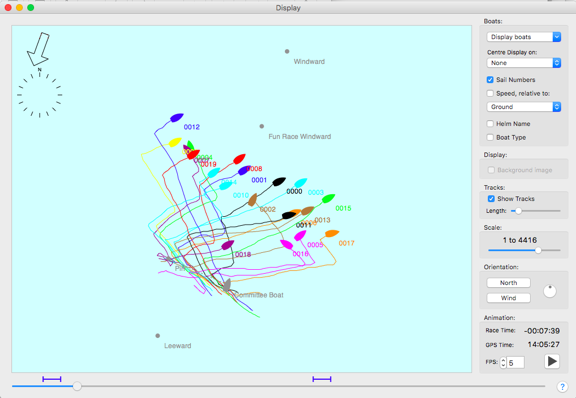 The screen shot shows the main display screen for a race half way through the first windward leg. The slider at the bottom can be dragged backwards and forwards to fast forward or replay the race. The control panel on the right hand side allows control of all aspects of the display (zoom, orientation, playback speed etc). The race data is saved in a GPX file for playback on another computer, either in SaiTrack, or in mapping software such as Google Earth to show the tracks relative to surface features. SailTrack runs on any Macintosh computer running OSX 10.4 or above and should work with any Garmin GPS device with a serial, USB, or memory stick interface. For models with a serial interface, you will need a serial to USB adapter to connect the GPS to your Macintosh. SailTrack will work with the Keyspan USA-19HS and the EasySync US232R-10.